Yes, really. Superhero and science-fiction fans can now celebrate together. Heroic Games have announced development of a new MMO - Ship of Heroes, promising to combine the best features of Space and Hero games in a spiritual successor to City of Heroes. Ship of Heroes has released video highlights from their successful combat Alpha, which focuses on team combat. The team of six is comprised of three supporters who have never played Ship of Heroes before and three developers. With one exception, each team member is playing a signature hero from SoH, and employing superpowers shown in previous videos. Sword Blossom, the Dual Swords Brawler, shows off a new offensive melee powerset for the first time. This Alpha comes almost exactly one year after the devs first published a sneak peek at combat in early 2017, with a single character fighting a small group of Nagdellian raiders. SoH has advanced a great deal since then, showing team combat, healing, tanking, buff and debuff, five offensive powersets, and three enemy groups. The fight concludes with a boss battle against a giant mech lasting just over one minute. The devs tell us they are making improvements, bug fixes, and expansions almost every day. They’re also listening to their community; for example, some supporters on the SoH forums requested X- and Y- axis inversion as an option, and it has already been added to the Alpha. In fact, one supporter was playing with his mouse controls inverted during the video. The devs at Ship of Heroes plan to continue repeating this successful Alpha test with new groups of supporters for some time. Dozens of people will get the chance to play the game, and give immediate feedback to a few of the senior developers. It’s an unheard-of level of transparency for a pre-launch MMORPG. We’re told the devs also plan to livestream at least one Alpha run. 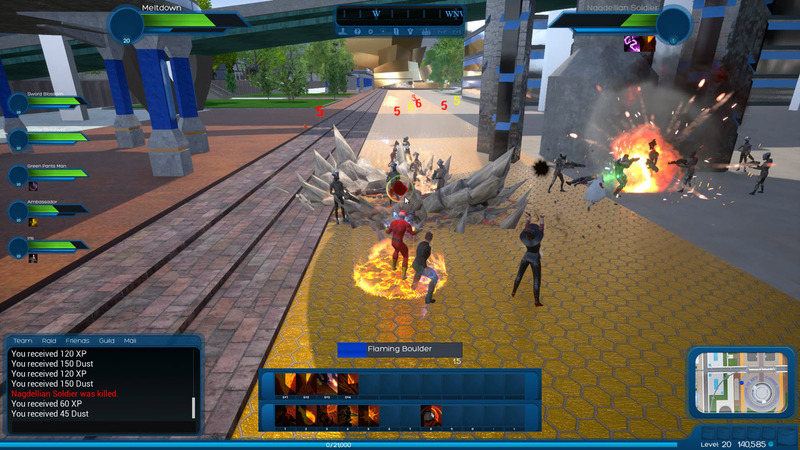 The devs at Ship of Heroes usually record their videos in-game using a client-server arrangement to provide the same appearance that a player will experience, and they did it again in this video. Each of the six participants downloaded a client, and then logged into an SoH server and played the game. Participants for these tests were located all over the US and in Europe. The three enemy groups in this video all pursue different combat strategies and possess different powers. For example, the Nagdellians use ranged weapon attacks and can beam in reinforcements during the fight. The Yekus can ignore taunt, and identify and attack the team’s healer, draining her energy. The Promethean boss at the end can hit a large area with a powerful AOE attack, and can also target individuals with a nearly-lethal strike. Ship of Heroes is making remarkable progress. The SoH devs are using a process of continuous integration, expansion, and improvement, not trying to build a final work product in secret. As a result, the Alpha video shows familiar elements such as the characters that have been made in the SoH character creator, the same persistent map – including recent improvements – and upgraded versions of previously-revealed FX. This is the 20th Ship of Heroes video published in just over a year. A timeline of progress would show the first two devs getting started 22 months ago, recruiting a mixed development team of players, volunteers and contractors, and delivering steady progress. Less than 16 months have passed since the SoH website went live, and 14 months since the first video, which showed Apotheosis City, appeared. A previous successful Alpha test of the SoH character creator (CCT) occurred five months ago, and the devs are reported to currently be working on a CCT upgrade based on community suggestions. Ship of Heroes is being developed in the Unreal 4 Engine, and is planning a Beta launch at the end of 2018. I was lucky enough to be invited along for one of those runs and I was very impressed with the way the city looks: Yes, it really is that clean and shiny and new and you can jump up onto things and run around all over the place... and we did. The signature heroes we played were created in the character creation tool that Heroic Games have built. The same one that the players will use. The combat is smooth. There was no lag at all connecting from Europe with Skype (yes, I know!) running in the background. We identified a few things that we thought should be changed, such as the aforementioned overly enthusiastic block on using powers when moving and the current lack of feedback when you hit an enemy as melee, and the devs were receptive to the ideas. In fact they'd identified a lot of those themselves but hadn't had time to change them while preparing for the alpha tests. The sound effects are the same placeholders as in other videos. The enemies, as we found out, have vastly different aggro ranges and tactics they can call on by design. It's going to be interesting meeting these for the first time in the live game. Most components of the UI can be moved around and locked in place and, yes, we do now have an x/y mouse invert (yay). All in all, considering this was an early alpha run to get feedback from players, it was very impressive, as well as being reassuring that things are going really well. I'm looking forward to the next updates and waiting (im)patiently for the game to go live. Open beta is currently planned for the end of 2018. "Ship of Heroes" and associated media copyright Heroic Games. Awesome Inc. theme. Powered by Blogger.